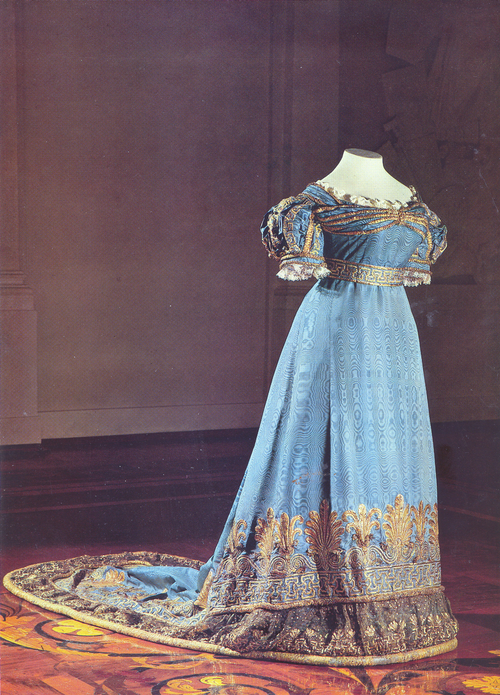 Costumes of the former owners of nationalized palaces and mansions first entered the Department of Regional Studies at the Russian Museum and then, after being moved from one place to another, were finally transferred, in 1941, to the newly established Department of the Hermitage Museum. 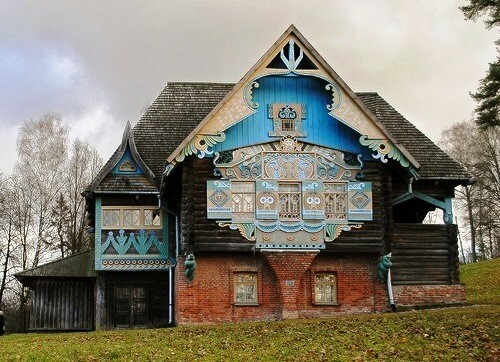 The Hermitage also came into possession of the “wardrobe of Peter the Great”, a remarkable collection of nearly three hundred items of men’s clothes, including lavishly embroidered formal costumes – splendid specimens of the decorative and applied art of the early eighteenth century – and everyday garments made of cloth which could have been worn by common townspeople. In addition, the Hermitage contains a small but noteworthy collection of merchant, lower middle-class and folk dresses, intended for holiday and daily use, which came from the collections of N.Shabelskaya, I.Galnbeck and others, or were assembled by the scientific expeditions of the Department of the History of Russian Culture in different parts of Russia. 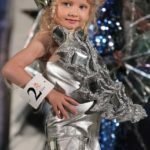 At present the Purchasing Commission of the Hermitage keeps buying from private sources both individual costumes with their addenda and whole collections. One of the most important recent acquisitions is the collection of V.Karakhan. It numbers over forty costumes of the first quarter of the twentieth century, many of which bear the trademark of the fashionable houses of Paris and Moscow. Today the Hermitage collection boasts several thousands of clothing items and rates among the richest repositories of this kind both at home and abroad. 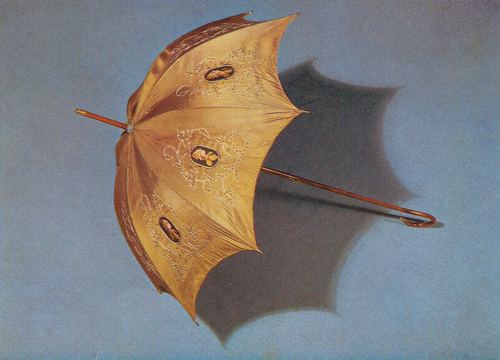 The umbrella of light-brown silk with applique work, gold sequins and beads. Wooden handle (length 72 cm). The first quarter of XIX century. The late seventeenth-early eighteenth century was a turning-point in Russian history. 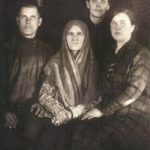 The Petrine reforms not only deeply affected the economic and political life of the country but also left a strong stamp on all aspects of Russian everyday life, the style of costume included. The traditional dress of pre-Petrine Russia was replaced by costumes in the Western fashion. The first Petrine ukase (decree) on changing dress, issued in 1700, was followed by a number of others. The observance of the ukases was absolutely necessary, with heavy fines imposed on those who disobeyed. The essential lines of male dress introduced by Peter the Great were laid down in the late seventeenth century. 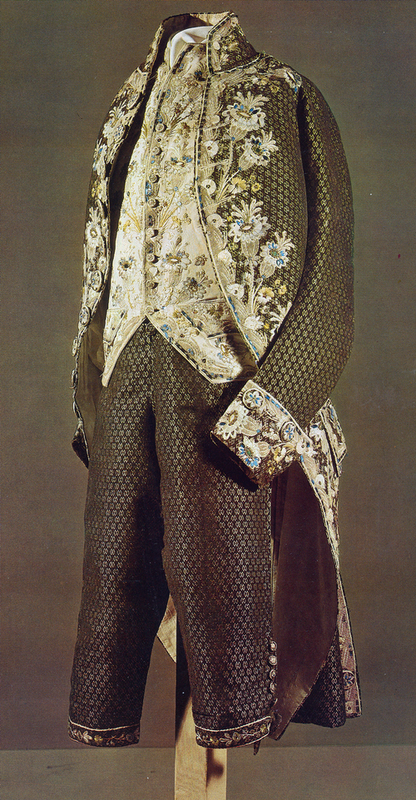 Borrowed from France, at the court of Louis XIV, this costume consisted of caftan (coat), jacket and trousers. The caftan was knee-length, close-fitting to the waist and flared out in skirts. The tall cuffs and the figured flaps of the pockets were furnished with buttons. 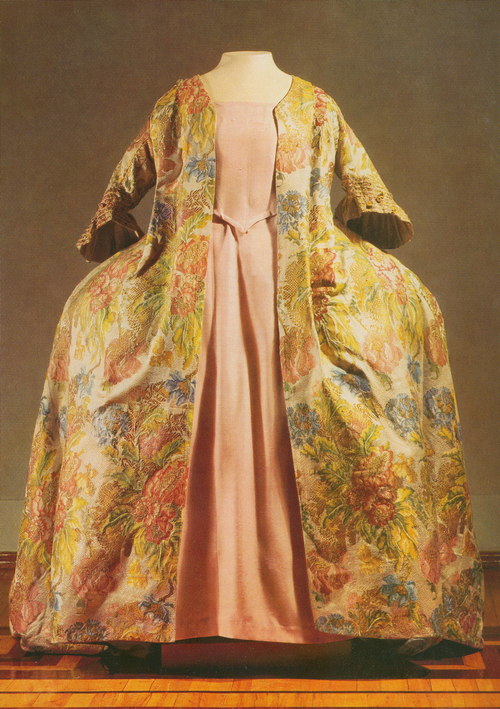 The jacket was shorter than the caftan, without pleats and collar, and with long narrow sleeves. The trousers were short, just below the knee. Everyday dresses were made of cloth or linen and decorated with fabric of contrasting colour and buttons. Festive garments of wealthy townspeople employed more expensive fabrics, such as silk, velvet and brocade, and were trimmed with lace and embroidered with gold and silver threads. The reform also affected female costume. 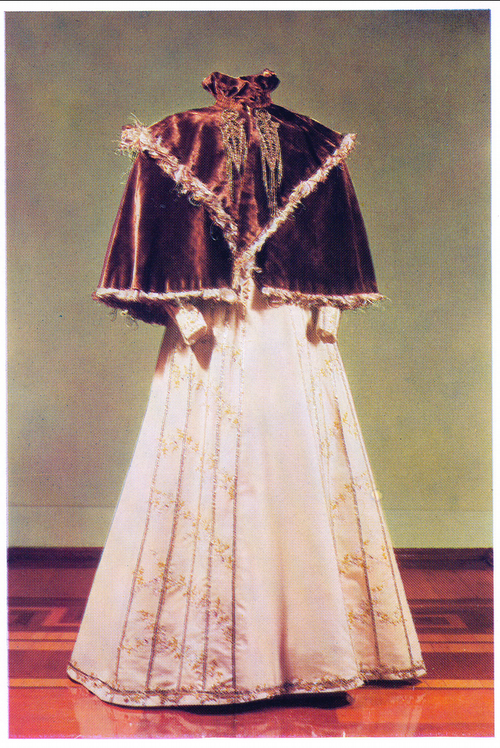 Padded jackets and sarafans were abandoned for luxurious French gown-robes with tightly laced corsages, rather deep décolletage, elbow-length sleeves and wide skirts. Like men’s dress, these gowns often had elaborate embroidery and lacework. Although at the beginning Peter’s ukases aroused great discontent among different layers of the population, towards the end of his rule the new costumes had become widely popular not only with the nobility but also with the progressive-minded merchants and manufacturers who supported the Petrine reforms. 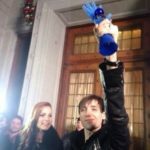 Since that time city costume in Russia has developed in the common mainstream with the Western European fashion. The male and female mode in the eighteenth century was rather stable: the type of men’s dress, established in the first quarter of the eighteenth century, with slight changes in proportions and details persisted into the 1780s. During this period men’s clothes were very picturesque and often made of the same fabrics as women’s apparel; they were richly embroidered with coloured silk, gold and silver threads, spangles and plate-glass. The dominant female dress in that period was the open gown-robe with a wide silk skirt, quilted with cotton in winter. To lend the gown’s silhouette a fashionable form, use was made of paniers or farthingales – special frameworks of wire, whalebone and thick fabric. Farthingales in the mid-eighteenth century could be one and a half meters wide. The “Watteau pleat” (a special cut of the back panel of the gown with the small pleats off the shoulders and the collar passing into a train), a characteristic feature of the period costume, had adorned women’s garments throughout the 1730s-40s. The singular silhouette and the decor of these dresses were in full harmony with the Rococo style of the furniture and interior decoration of the time. The men’s costume parade. 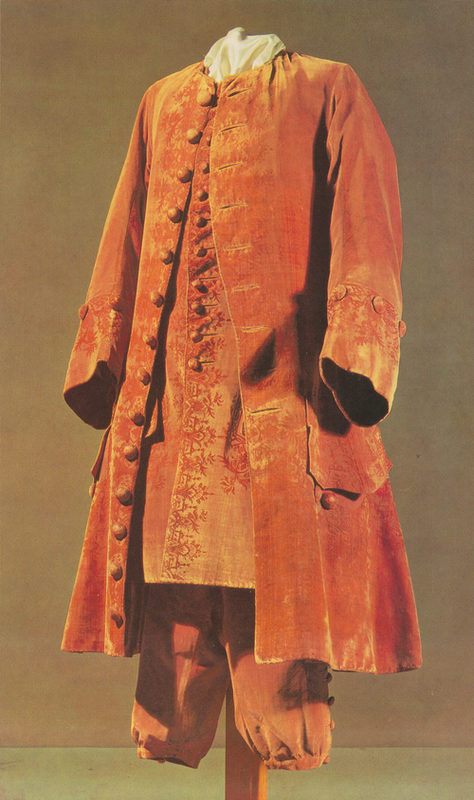 Coat and pants from black and brown velvet with small geometric designs, woven with Golden silk. 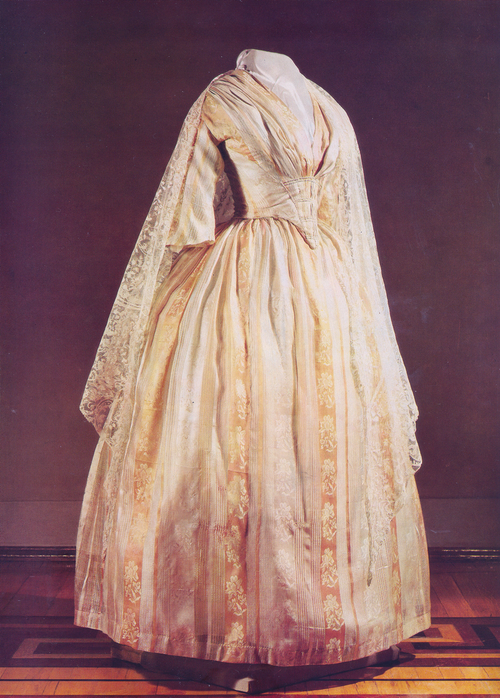 Catherine II’s attempts to introduce at her court the so-called Russian dress are evidenced not only by her ukases but also by the surviving uniform gowns of the Empress. Sewn of the fabrics of the same color as that of the uniform of a corresponding regiment, these gowns, decorated with a uniform galloon and buttons, combined the forms of the then prevailing French fashion (loose garment on farthingales) with elements typical of the early Russian women’s attire (folding sleeves, arrangement of decor). In the late 1770s-early 1780s costume underwent essential changes under the influence of the ideas of Jean Jacque Rousseau, who called on people to do away with the luxury and idleness of society and to return to nature. The same period also witnessed the growing influence of English costume which, owing to its historic development, was more rational and less sensitive to any whims of court fashion. New trends became especially tangible after the French Revolution. The style of Classicism which by then had become widespread in architecture, sculpture and painting, found a vivid reflection in period costumes. Sumptuous gown-robes gave way to tunic-like garments. 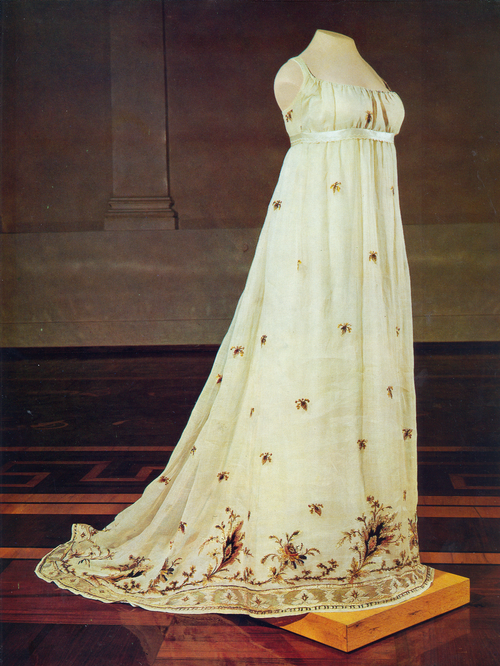 Heavy silks, velvet and brocade were replaced by thin fabrics of linen, predominantly white in color. Farthingales, corsets, whalebone in corsages disappeared. Coming into mode were dresses with a highly lifted waist, low décolletage and short sleeves, with the skirt falling down the waistline in soft, ample folds and ending into a train. Period costumes were distinguished by the clear-cut lines of the silhouette: women wearing such toilettes resembled antique statues. This fashion spread very swiftly all over Europe and, despite the opposition of Paul I, who was frightened by the events of the French Revolution, penetrated Russia as well. Ball gown of silk blond lace with a floral ornament, 1820s. 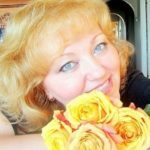 An indispensable part of female dress in Russia in the late eighteenth to mid-nineteenth century were woolen shawls and scarfs. They were worn in summer and winter, and their owners would put them on even for balls. Such shawls came originally from the Orient, but later their production started in Western Europe and in Russia. 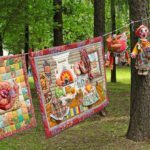 Especially valued for their superb workmanship were Russian shawls woven by anonymous craftsmen – serf women of the landowners Merlina, Eliseyeva and Kolokoltsov. These shawls were made of the wool of Tibetan goats, spun as thin as a hair in the complex technique of double-sided weaving. Extraordinarily vivid and colorful, without an inside, they lent a unique charm to period costumes, amazing contemporaries by the wealth of their elaborate floral designs and their virtuoso execution. A departure from the refined simplicity of costume, which began in the late 1810s, reached its peak in the 1820s. The gown became shorter, lost its lightness, the silhouette got less strict and plastic, and the corset reappeared. The skirt, flared out at the sides and gathered up along the back panel, acquired the shape of a bell and was now worn on the starched petticoat. Thick silks, velvet, woolen cloths came again into fashion. The garment’s trimming involved more and more such elements as rouleaux, flounces and gathers. The close-type everyday dresses were often sewn from muslin and tulle and richly adorned with garlands of flowers or embroidered with beads, gold and silver threads, as well as polished steel plaques for which the gunsmiths of Tula were famous at the time. The train remained only with gala court dresses. These were made of thick silk or velvet and decorated with a lavish pattern of palmettes, meanders and other components of the Empire-style ornament embroidered in gold thread. During the late eighteenth-early nineteenth centuries an essential part in women’s wardrobe belonged to such types of outdoor garments as the redingote, which simulated the fashionable lines of the gown, and the spencer – a short long-sleeved jacket usually lined with fur or cotton. Beginning in the first decades of the nineteenth century, male costumes, unlike those worn by women, acquired a stricter, functional character and were of little interest as regards their artistic merits. The Romantic movement whose influence can be traced to Russian literature and the figurative arts, made a certain imprint on the shaping of costume too. 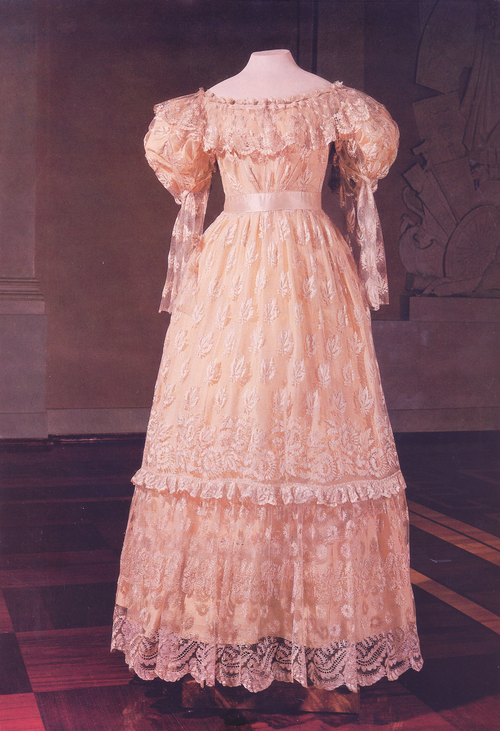 The “Romantic” type of dress had established itself in Russia towards the end of the 1820s-30s. Its silhouette was determined by the increasingly expanding skirt and the bodice with a “wasp waist”, the deep décolletage and the bulging sleeve densely gathered at the shoulder and close-fitting to the wrist (hence the name gigot or a leg-of-mutton sleeve). Court gown of blue moire, open, high waist, short sleeves.The 1820s. A new silhouette, new proportions and a new decor single out female dress in the 1840s. Whereas in eighteenth-early nineteenth century Russia the trendsetters in fashion were the aristocracy, in the second half of the nineteenth century this role was claimed by the upper bourgeoisie. There was a passion for gaudy luxury which entailed the overloading of women’s dress with expensive cloths, trimmings and embellishments. The mode often changed, borrowing details of the costume of past epochs and combining them at random. In the 1850s-60s the skirt expanded so greatly that in order to preserve the fashionable silhouette a special framework of steel hoops, crinoline, was used. The choice of material, the cut and decor of garb hinged increasingly on its purpose. In the second half of the nineteenth century, in connection with the mechanization of the textile industry, fine cloths, machine-made lace and embroidery became accessible to the broader circles of buyers. The sewing machine made cheaper the manufacture of clothes. The appearance of a large number of vogue magazines contributed to better information on the changes in the world of fashion. First shops of ready-made clothes were opened. A certain democratization of the mode was in the air, but dresses of the well-to-do still remained very expensive and their trimming and decoration required a painstaking manual effort. Particularly luxurious were the formal clothes of court ladies so aptly called “ladies’ uniforms” by Alexander Pushkin. Although the gowns of this kind here presented date from the second half of the nineteenth century, they repeat the samples made in compliance with the ukase of 1834, which strictly specified the cut, color, fabric and character of gold embroidery in dependence on the rank of a court lady. Such costumes preserved the cut of the open-type dress made of velvet with a white satin skirt, a fairly deep decollete bodice, folding sleeves and a very long train whose length was determined by its owner’s court rank. A kokoshnik (close-fitting cap) with a veil completed this garment. Contemporaries aptly called it the “Frenchified sarafan”. Among the workshops which produced such toilettes, the one of O. Bulbenkova, founded in St. Petersburg in the second half of the nineteenth century, enjoyed particular renown (it also functioned in the early twentieth century). In the 1870s-80s female costume acquired increasingly fanciful forms. 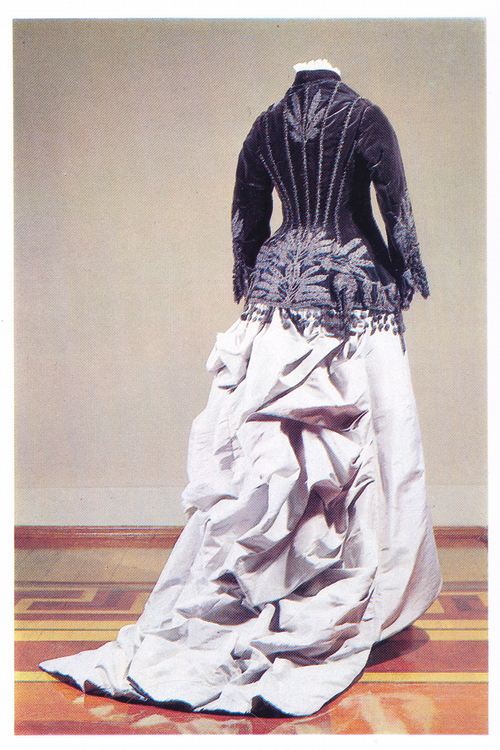 The crinolene went out and the tournure (the bustle) came in, and in the 1880s there appeared the so-called bodice-armour and asymmetric drapings. 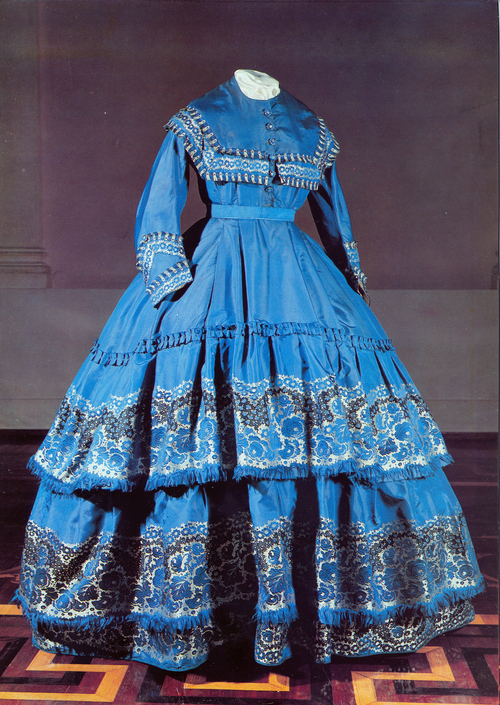 A characteristic feature of the time was the use in a single dress of heavy cloths different in texture, colour and design: plain and patterned satin, velvet, plush, as well as the abundance of drapings, lace trimmings, fringes and embroideries worked in beads and bugles. Such dresses matched brilliantly the contemporary drawing-room interior which was overcrowded with furniture, upholstered with cloth, massive drapery of the curtains and a host of intricate gilt frames. The recognized authority in the world of fashion at that time was the French designer M. Worth. His firm, founded in Paris in 1857, had greatly influenced the development of costume until the beginning of the twentieth century. The entire beau monde – from the Queen of France to a celebrated actress – was anxious to be dressed by Worth. He also fulfilled various commissions of the Russian aristocracy. The dresses bearing the trademark of this firm are noteworthy for their specific elegance, the superb feel of their line and material and their ingenious colour schemes. In the late nineteenth-early twentieth centuries the Russian fashion designers Brizak, A.Ivanova and A.Gindus attained great popularity in St.Petersburg. The creative output of N.Lamanova, who opened a workshop in 1885 in Moscow, deserves special mention. A remarkable collection of dresses by this interesting designer now in the Hermitage Museum provides a glimpse into the evolution of her individual style. The emancipation of women, their participation in the social and active life of the country, and a general enthusiasm for sport had a profound effect on the fashion of the turn of the century. The necessity arose of creating dresses which would be more suitable for free movement. The main direction of the mode in that period was common to all layers of the urban population, except that the costumes of wealthy customers were still distinguished by expensive cloths, magnificent decor and high artistry of the tailor. The garments of women from among the intelligentsia and the petty bourgeoisie were more modest, more rational and more adapted to every kind of occupation. Subsequent years saw the further simplification of costume which became more practical and more sharply differentiated between modest day dresses and evening toilettes, the latter featuring a variety of form and decor. Among the fashion designers of the early twentieth century the most striking figure was Paul Poiret of Paris -the bold innovator in the field of the swiftly changing mode of those years, whose individual style was largely formed under the spell of the decor and costume designs made by Leon Bakst and Alexander Benois for the performances of the Russian Ballet in Paris. It is indeed to these designs that the intensive and bold colour schemes and the novel forms of the dresses produced by Poiret are indebted. The period after 1914 was a turning-point in the development of costume in all European countries. The First World War, the changes in the conditions of life that ensued, the increasingly wide involvement of women in the active life of their countries, and, finally, the Great October Revolution that radically changed the entire mode of life in Russia, all these factors have played their role in the subsequent development of costume, ushering in a new era in the history of this field of applied art. 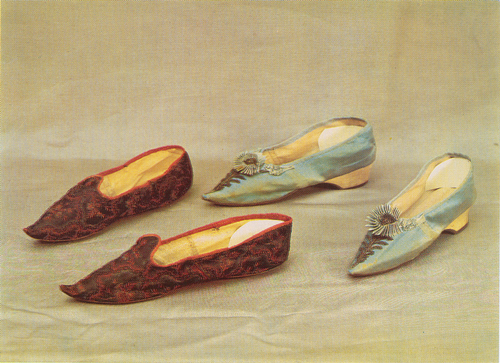 Shoes blue satin, with a long narrow toe, low solid heel (height 3 cm), decorated with rosettes of the same silk and embroidered with gold sequins and thread. 1790-ies.